Discretion Brewery at 2703 41st Avenue in Soquel has installed an LED cable lighting system that is low-energy, functional and fun to look at. 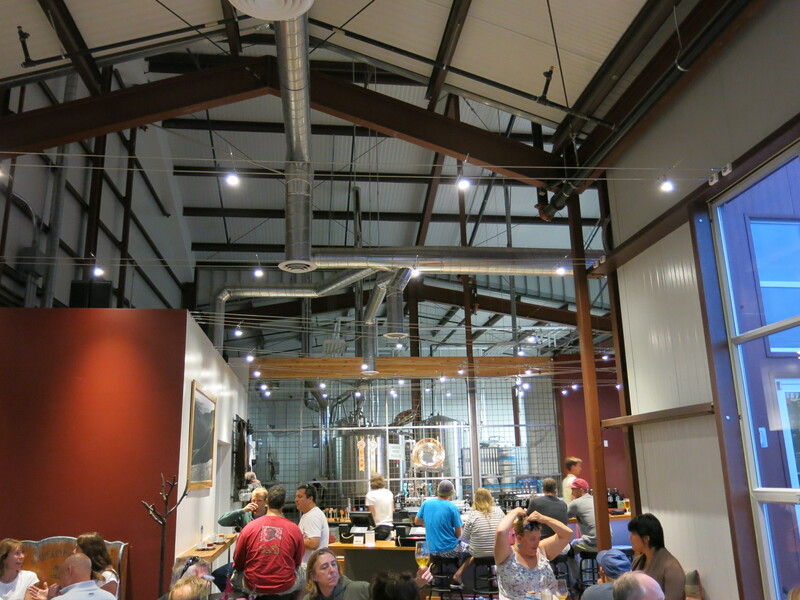 The stainless steel fixtures and cable with the white light LEDs are successful in blending the bar and dining area with the equipment and lighting in the brewery section allowing customers to be part of the brewing process. 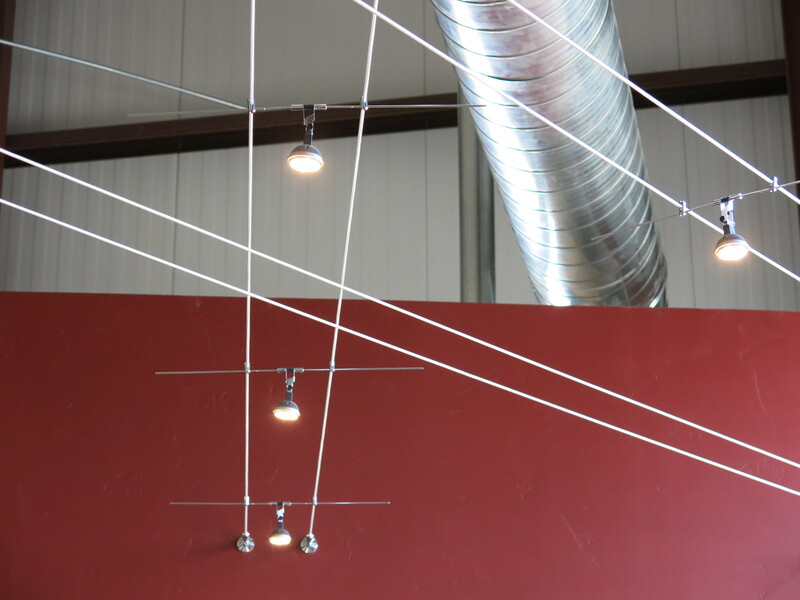 Mounting the lights on a cable system made functional sense in a building with 20-30′ high ceilings. 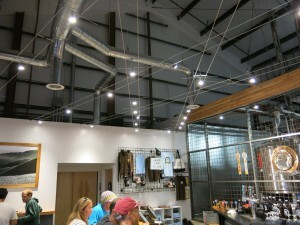 It eliminated using either hanging the lights on 20′+ long wires or using bright warehouse style lighting, neither of which would have created as pleasant of a lighting experience. In addition the mesh of steel cables helps pull the room together giving it a sense of connected strength. 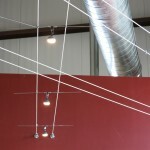 The class 2 cable lighting system is from Prima Lighting www.primalighting.com. The low voltage (12V) in this case, drivers are remotely mounted. 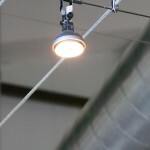 This allows the cables which distribute the safe low voltage to the LED lights to be free from anything but the lights. The lights are Philips Enduraled MR16, 10W, 3000K dimmable LEDs. Each light emits 538 lumens. 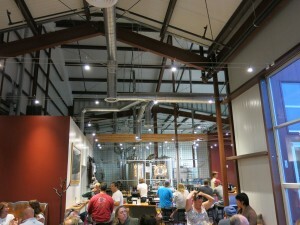 The bar and dining area has 60 lights for a total of 600W at full brightness. Being able to dim the lights in restaurants helps set the mood. There are several dimming zones here and the dimming is smooth, flicker free and deep. 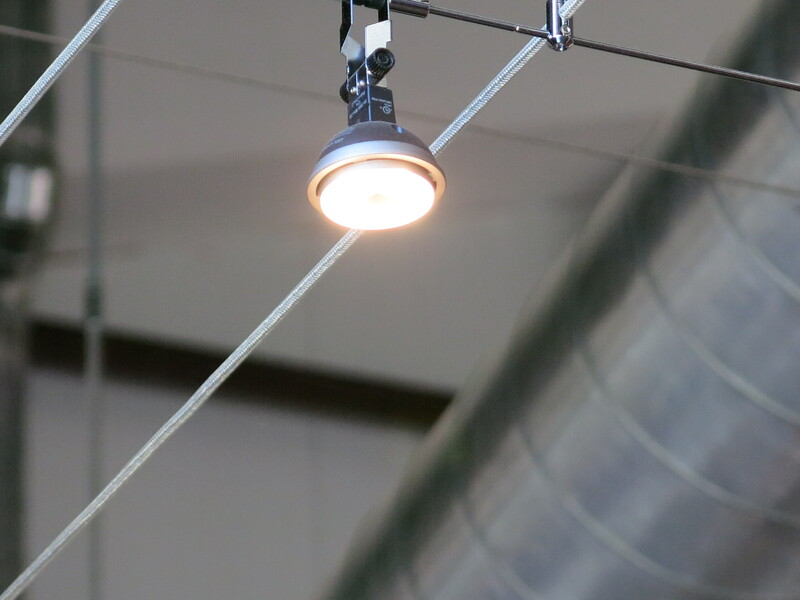 Having the capability to spread the 60, 10W LEDs throughout the room along the cable allows each group of people to have their own light, creating personal spaces but having the same lights throughout creates a sense of camaraderie.